CarboEastAsia Special Session during the 55th Symposium of the International Association for Vegetation Science (IAVS2012) in Mokpo, Korea. The special session entitled "CarboEastAsia - Lessons from Collaborative Research on Ecosystem Carbon Dynamics in East Asia" was organized during the IAVS 2012 and twelve study results were presented. CarboEastAsia hosted two symposium, "Exchanges of various gas components between the atmosphere and terrestrial ecosystems" and "Integrated Studies on Carbon Balance of East Asian Terrestrial Ecosystems". 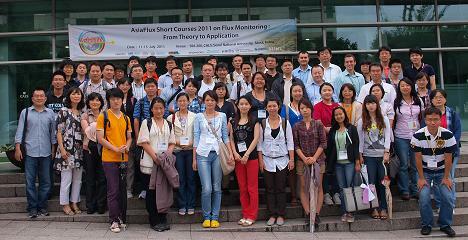 The seminar was held along with AsiaFlux short courses on “Flux monitoring: from theory to application”. Several discussions were facilitated to wrap up the 1st year activities. A3 Workshop in Tokyo - "Data-Model Synthesis for Quantifying Carbon Budget in East Asia"
CarboEastAsia workshop focused on Subprogram 2 and 3 was held. Participants discussed such issues as creation of standardized flux data sets and approaches for model-intercomparison. CarboEastAsia hosted a session, introduced its research outcomes and discussed potentials of collaboration with other research communities. The 3rd A3 Workshop was held in Beijing, China with ChinaFlux as the host. The 2nd A3 Seminar held in Sapporo, Japan with JapanFlux as the host. The Seminar was held as one of special sessions of AsiaFlux Workshop 2009. The details of the Seminar (CarboEastAsia Session of the Workshop) program and proceedings are available at AsiaFlux web site below. The 2nd A3 Field Campaign will be held in Xining and Haibei Alpine Meadow flux site jointly with ChinaFlux Training Course with ChinaFlux as the host. The Training Course and Field Campaign annoucement and programs are available below. 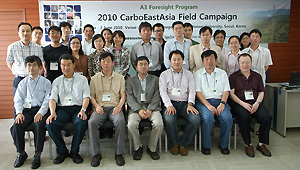 "CarboEastAsia Workshop 2009 - Toward Integration of Field Observations, Remote Sensing, and Modeling"
Copyright (C) A3 Foresight Program "CarboEastAsia". All Rights Reserved.